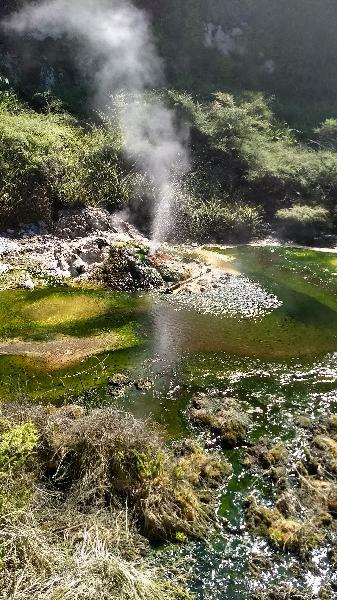 This exciting geothermal attraction has a very unique ecology with rare botany and plenty of fascinating geothermal features to explore. See the Hypnotic steam rising from the Echo Crater, marvel at the stunning Frying Pan Lake (the world's largest hot water spring), and take in the beauty and dazzling blue of the Inferno Crater hot lake. The newly forming silica terraces are also a highlight not to be missed. 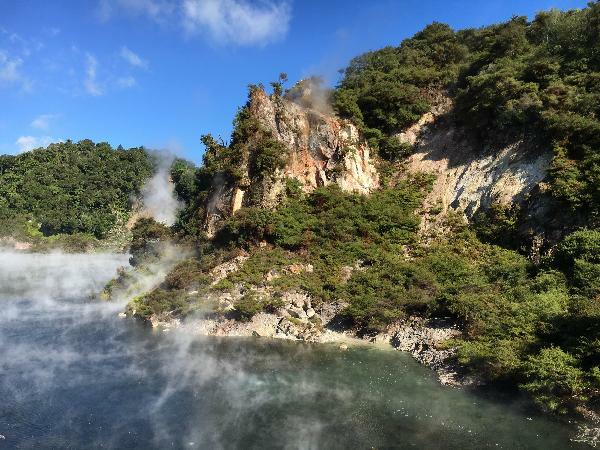 Waimagu Volcanic Valley is a protected scenic reserve and includes the beautiful Lake Rotomahana. The entire valley is shrouded in pristine native forest providing sanctuary for a wide variety of New Zealand birdlife. At any stage during your walk, you can jump on board a courtesy shuttle which regularly circles the valley back to the Waimangu Visitor Centre. A range of easy, mainly downhill walkways through pristine native bush, teaming with spectacular birdlife and geothermal highlights. 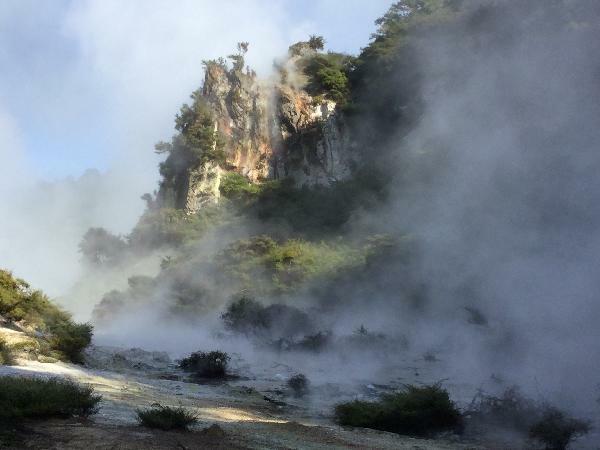 Encounter hot pools, steaming volcanic craters, newly forming silica terraces, rare geothermal plants and the multi-coloured rocks of this mysterious and beautiful valley. If your looking for a bit more of an expedition opt for an invigorating hike along the Mt Haszard Hiking Trail taking you high above the valley floor with superb panoramic views of the unique landscape. 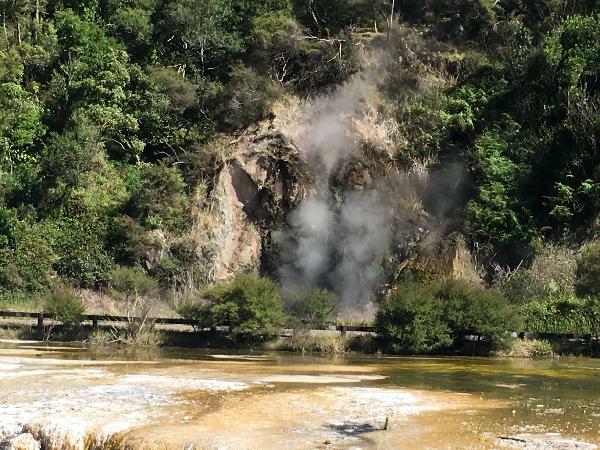 Beginning at the inferno crater the Mt Haszard trail follows parts of the original Waimangu walking route from the early 1900's when visitors came to view the Waimangu Geyser erupting. Note: Suitable footwear and a degree of fitness is required for the Mt Haszard Trail, which is steep and rough in places and isn't suitable for children, pushchairs or wheelchairs. 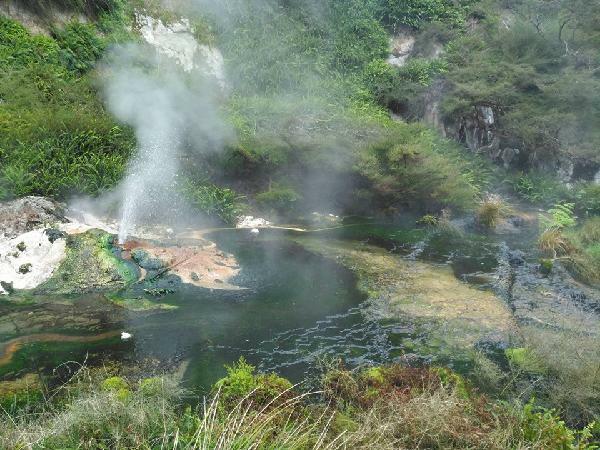 Waimangu Volcanic Valley is just 20 minutes South of Rotorua or 40 minutes North of Taupo. IMPORTANT: Waimangu Volcanic Valley allows a 30 minute grace period after the discounted booking time (please note opening time each morning is 8.30am and last entry is at 3.30pm). Outside of this grace period you will have to pay the difference in rate to enter. Cancellations within 24 hours non-refundable. Not suitable for wheelchair users. Well worth the time to visit!! Amazing natural scenery, easy walking track & great staff. 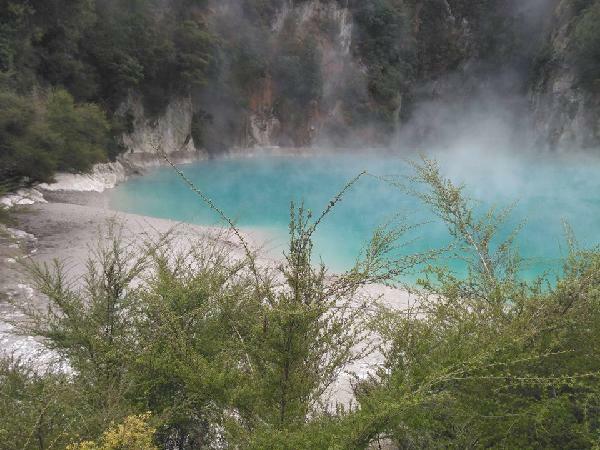 Only a short 15 minute drive from Rotorua & well worth it. Totally worth it. Beautiful well done walkway with plenty of places to take pictures. We did the whole self guided walk to Lake Rotomahana & took the shuttle bus back. The 60 minute leeway on either side of the booking is a real plus. Tip: go early if it looks like the day will be hot. The geothermal activity wasn't that striking. I found only the vivid blue devil's crater was an interesting sight. Wai-o-tapu is wai-better. Also, the bookme fare doesn't include the shuttle from Rotorua, and I had to pay $45 for it. My daughter and I enjoyed the scenic stroll. The paths are very well maintained. Take snacks and lunch with you. I didn't think about this and paid a fortune at the cafe there. 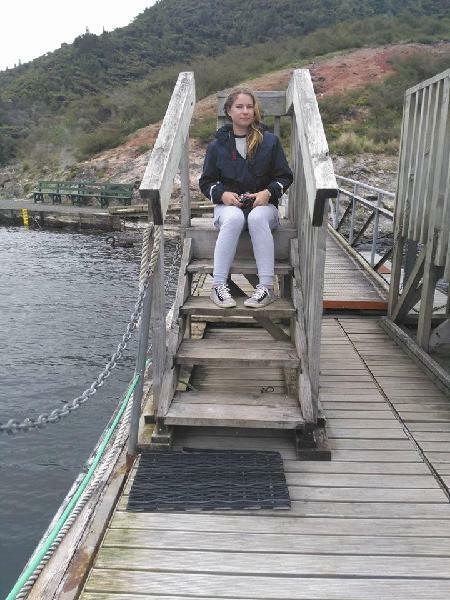 The boat cruise was enjoyable more for the historical content which fascinates me. Your calf muscles may feel stiff the next day from all the down hill walking - lucky there are lots of mineral pools to soak in nearby. Dress appropriately for the weather. The staff are lovely. Please take only photos - someone had taken an egg from a nest then dropped it - very disappointing. Your message has been sent to Waimangu Volcanic Valley. You should hear from them shortly. Please note: all responses will come directly from Waimangu Volcanic Valley, and not the team at Bookme.